This week: Katy Perry showed up and AHHHHHHHHHHHHHHHHHHHHHHHHHHHHHHHH KATY PERRY AHHHHHHHHHHHHHHHHHHHHHHHHH THIS IS THE WEIRDEST BUT BEST MUSIC VIDEO MADE WITH SEC PROPS. Tony Washington took a bow which elicited a yellow flag. The penalty was excessive celebration. It put Arizona in the position to score and placed Oregon’s playoff hopes in jeopardy. The Ducks’ fate was sealed in the closing minute, when Scooby Wright III snatched the ball out of Heisman hopeful Marcus Mariota’s hand. After Arizona’s win, Wildcats head coach Rich Rodriguez erupted in his signature West Virginia twang that once made Michigan Men and Women groan. “YOU THINK THEY AIN’T PARTYIN’ IN TUCSON, ARIZONA?” he yelled to his team in the locker room. The true perpetrator of excessive celebration was America and we would later be penalized for it on Sunday morning. Mississippi is the floor for Southerners who have a progressive bent. Yeah, North Carolina passed Amendment One, but at least we’re not Mississippi. Georgia wants to appeal parts of the Voting Rights Act, but at least we’re not Mississippi. The Magnolia State was the place where Robert Johnson sold his soul to the Devil to play the blues because that’s the only option Mississippi gave him. It’s this kind of mythology coupled with a troubling history that makes these people want to put the state a hundred miles in the rear view and out of their consciousness. Yet, if you asked these people where they could have been this weekend, it most likely would have been in Vaught-Hemmingway after a 5’9″ Senquez Golson intercepted a pass from Blake Sims to beat Alabama for the first time in ten years. Mississippi State and Ole Miss were both undefeated heading into the weekend for the first time since 1961. Both of them, facing SEC West opponents, and both of those opponents, ranked. Coverage of the state’s big weekend kicked off with a College Gameday production chock full of message board fodder that Clay Travis used for a terrible book. It all ended with Katy Perry in a fuzzy pink sweater picking games, her only connections to Mississippi being her manager and the similarities she shares with a fellow musical appropriator who was born in Tupelo. She predicted that both state schools would win out, while Lee Corso, a man who was completely at ease with a duck spooning ungodly amounts of sugar into his mouth, failed to comprehend the pop culture entity. The Bulldogs began their day beating the brakes off of an A&M team that was dressed as a turbo charged, two tone Pontiac Trans AM. Dak Prescott lived up to all of the preseason hype by throwing for 259 yards and two touchdowns. His stat sheet was also padded with the work he did on the ground through scrambles and QB keepers that led to three touchdowns on the day. While he did rack up 365 passing yards, Kenny Hill was intercepted three times in the game. Mississippi State’s defense had their thumb on the Aggies until a late surge in the fourth quarter that was all for naught. Dan Mullen’s team is operating at a strength unforeseen in Starkville, and a win at Auburn next weekend could further disturb the status quo of an SEC West pecking order that’s had its focus on Alabama in recent years. Gameday has already announced that it is continuing its residency in Mississippi by broadcasting live from Starkville next weekend. 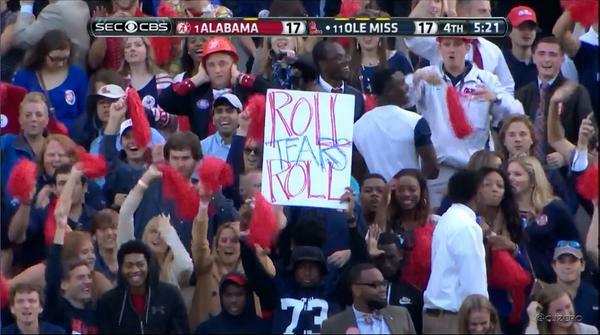 Let’s just hope that they can recover in time from the chaos in Oxford. Before the game, Bo Wallace has been plagued with the distinction of inconsistency. Pundits have referred to Wallace in the same way you would someone with multiple personalities. There is “Good Bo” and “Bad Bo” – a distinction that Dr. Bo addressed by saying that he feels like he’s the only quarterback that throws interceptions. A slow start on the day for the Rebel offense gave little in the way of a response for the Crimson Tide, who outscored Ole Miss 14-3 going into the second half. Slowly, Wallace started to gain steam by finding Laquon Treadwell for a 14-yard pass to pull within three of Alabama. Then, after the bruising Ole Miss defense limited Lane Kiffin’s explosive offense to a field goal, the third quarter closed, and the Bo Wallace most closely associated with Dr. Jekyll emerged. Wallace threw a 34-yard bomb to a wide-open Vince Sanders, who bested Alabama’s best defensive back Landon Collins. Another possession later, with pressure mounting to take the lead, he would find Jaylen Walton for a ten yard pass. A failed point after attempt placed the difference at six points with 2:54 left. The closest parallel to this was in Baton Rouge in 2012, when LSU allowed Alabama to march down the field with TJ Yeldon in the final minutes to win the game and keep its championship ambitions alive. The difference between that game and this was a perfectly drawn up Kiffin-esque pass play in the end zone that was derailed completely by an unbelievable vertical by Senquez Golson. Ole Miss would down the ball to destroy The Nick Saban Process while giving the Rebels coaching staff something other than potential to talk about in the living rooms of recruits. The best consolation that Mississippi could take in their two SEC football programs was winning the party and beating each other. Now, they are both tied for third in the AP poll. They just have to survive two more months of SEC West competition and each other in order to have the best team either school has seen since Don Draper was alive. The potential to be tripped up is exponential in the division, but hey, at least they are not in the SEC East. As the scenes of goal post routes, Katy Perry bar dives, and celebratory make outs began to roll in, TCU was finishing off an Oklahoma team that failed to contain Trevone Boykin. Boykin, last year, had trouble establishing himself in the quarterback position and this year has rebounded with a campaign that has earned him the distinction of being the ninth best offensive producer in the country. His play, combined with an TCU interception of Trevor Knight in the fourth quarter, had the Horned Frogs faithful rushing onto the field to ring in another disturbance among the Playoff Elite. The firestorm of disorder would continue through the night. Mark Bercovici, the backup quarterback for the Sun Devils, would throw a wild Hail Mary pass into the Los Angeles night that would land in the arms of Jaelen Strong to beat USC. Michigan State would hammer Nebraska into submission, handing the Huskers their first loss of the season. Rutgers would rally in the end to punish a Michigan that is now at a low which has been unseen since 1967. Utah knocked off Pac-12 South favorite UCLA to bolster Arizona’s chances toward a great run in the division. Auburn would wallop LSU and turn it into a purple and gold paste. Washington State missed a game winning field goal to hand the game to now Pac-12 North leader Cal and give Connor Halliday another losing effort. Wisconsin would fall to Northwestern in a twist of fate that has placed the Wildcats in the opposite position of their ill-fated 2013 campaign. In the end, with windows busted out and goal posts torn down, four teams in the top six fell in the same weekend for the first time since 1990. College football is perfect in how inherently imperfect it is. Talent varies from program to program, and this is on display every weekend. A program can have all the talent in a football-rich state but still fall to historic lows. A team can mire in mediocrity for years until a steadfast dedication to raise the profile of program. Some fans of professional football think it’s a silly exercise to trifle with what they deem as the NFL’s farm league. Yet, because of it’s imperfections, titans can fall on any given crisp, Saturday in the Fall. For this, we shall celebrate, at least until we are penalized for it.